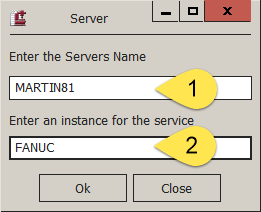 You can enter the DNS-Hostname or IP-Address of a remote PC (1) under ‘Enter the Servers Name’. If you do not enter anything CNCnetControl assumes that you try to connect to CNCnetPDM on the local PC. Note: This dialog also automatically opens if you open CNCnetControl on your PC without CNCnetPDM running on the local PC. After clicking on OK CNCnetControl tries to connect to the specified CNCnetPDM program or service. If successful the title bar of CNCnetControl changes according to the information entered. If the specified PC or service cannot be reached you see a dialog with an error message.